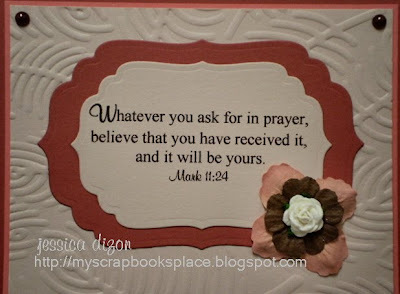 The challenge is to make a project/card about prayer and/or peace. 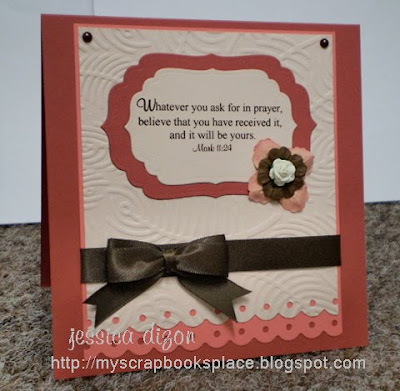 My Bible verse is one of my favourites and I printed onto Blush Blossom with brown ink. I cut it with Labels Four and matted it onto Ruby Red also cut with the same die, the next size up. The Blush Blossom panel was embossed with Fiskars texture plates (Feathers) and the verse panel were both sprayed with Glimmer Mist Pearl. I finished off the card with some Chocolate pearls, chocolate satin ribbon (made with Bow Easy) and assorted flowers with a paper rose. I really like this Bible verse as it gives me the sense of security knowing that our God hears and answers prayers. We just really have to believe by faith and our prayers will be answered. Thanks so much for the visit. God bless us all. So pretty, Jhet!! I love those colors together! Fantastic embossed detail, too!! Jessica this is so beautiful!!! I love the rich tones and the wonderful verse! The texture plate you used is really pretty! Thanks for playing along at Stampin Sisters in CHrist!